ArabSaga: "Annan came too late, possibly much too late"
Kofi Annan came too late, possibly much too late. It would have been better if he made an entry a year earlier. A ceasefire could have worked, and so the withdrawal of heavy weapons and forces from population centers. The prisoners could have been released, foreign journalists could have been allowed to move freely and the dialogue on reform could have started on the basis of little change and ample continuity. A year ago, there would have been fewer funerals of civilians and men in uniform, and not as many prisoners, devastated cities and townships, “Friends of Syria,” “armed gangs,” deserted embassies and Arab and Western sanctions. A year ago, exiting the tunnel would have been possible by disciplining one officer here and another there and retiring the Baath Party without anyone demanding its “eradication” as befell its twin in Iraq. An independent figure, not one hatched by party and security branches, could have been named prime minister. A calm process could have been initiated to restrain the security branches and keep away the ugly scenes from the screens. A year ago, the ceiling of opposition demands was lower. The flames could have been doused before spreading. I keep reverting to Annan’s plan, always concluding he came much too late. Moscow might regret her prudence later on. Had she helped formulate this sort of plan earlier, she could have spared the Syrian regime its current predicament. She could have dispensed with her own present muddle as well. It is too early to say Moscow succeeded in exploiting the Syria crisis simply to remind of her interests, status and role. I believe Washington is glad to see her – like Iran and Hezbollah – at odds with most Arabs and Muslims. Some people impute Russia’s support of the Annan plan to her wish to extricate herself from this mess. In any case, Annan’s plan is not good news for Syria’s regime, although the plan was tabled after the door was slammed shut on military intervention under either the UN flag or NATO’s. But having been endorsed unanimously by the international community, the plan puts Syria under international supervision. This means supporters of the plan don’t buy the Syrian line suggesting the confrontation is between law and order forces and “armed gangs” driven by external sides. Annan’s plan came behind time – that is, after all players had gone too far. By players, I mean the regime, the opposition, the region’s heavyweights and the Big Powers. What was possible a year ago seems impossible today. The propensity for compromise evaporated with the heavy losses sustained by the parties. 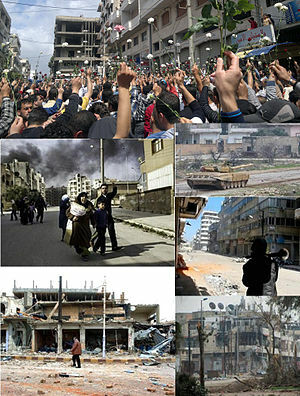 The confrontations seriously hurt the regime’s standing, its icons and its institutions – particularly the army. They also gravely damaged relations between the components. Neither the regime nor its opponents can afford to backtrack after 10,000 people dead and hundreds of thousands detained. Kofi Annan turned up late. His plan’s demands are too exacting to elicit regime compliance. The regime has difficulty holding fire and pulling out armor when it entails protesters returning to fill public squares. Shooting was meant to thwart a Syrian Benghazi and million-strong marches. How can the regime release detainees when the opposition can still take to the streets? And how can the regime respect the right to demonstrate peacefully and ensure freedom of movement across the country for the foreign press to document its doings? Over and above, the opposition insists any dialogue with the regime should be about the transition stage. All this simply assumes the regime’s acceptance of everything it had previously rejected, especially that the plan requests the regime to de-structure itself piecemeal. Clearly, Annan turned up after it was too late. Nobody had a solution at hand, so everyone raised Annan’s banner. His mission is crucial and hazardous because post-Annan won’t be anything like pre-Annan.